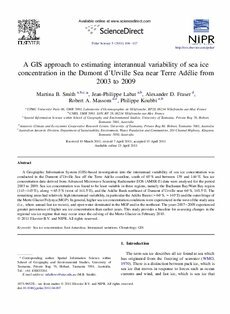 A Geographic Information System (GIS)-based investigation into the interannual variability of sea ice concentration was conducted in the Dumont d'Urville Sea off the Terre Adelie coastline, south of 65S and between 139 and 146E. Sea ice concentration data derived from Advanced Microwave Scanning Radiometer-EOS (AMSR-E) data were analysed for the period 2003 to 2009. Sea ice concentration was found to be least variable in three regions, namely the Buchanan Bay/Watt Bay region (143â€"145E), along ~65.5S (west of 144.5E), and the Adelie Bank northeast of Dumont d'Urville near 66S, 140.5E. The remaining areas had relatively high interannual variability, in particular the Adelie Basin (~66S, ~140E) and the outer fringe of the Mertz Glacier Polynya (MGP). In general, higher sea ice concentration conditions were experienced in the west of the study area (i.e., where annual fast ice recurs), and open water dominated in the MGP and in the northeast. The years 2007-2009 experienced greater persistence of higher sea ice concentration than earlier years. This study provides a baseline for assessing changes in the regional sea ice regime that may occur since the calving of the Mertz Glacier in February 2010.